1- Why should I register my marriage/birth in Lebanon? Register to Preserve YOUR Heritage! Register To Make your Voice Heard and Effect Positive Change in your Country of Origin. Register To Preserve the Demographic Balance Among the Different Religious Communities. Register To make sure Lebanon Remains, as we know it, "an Island of Democratic Ideals, a Message of Freedom, a Living Example of Coexistence and Conviviality, and a Symbol of Pluralism for both the East and the West" (Source: Pope John Paul II: "The Apostolic Exhortation: A New Hope for Lebanon," 1997). 10. To earn the right to inherit property and values. "You should be proud of being an American, but you should also be proud that your fathers and mothers came from a land upon which God laid His gracious hand and raised His messengers" - Khalil Gibran [Source: I believe in you- (to the Americans of Lebanese origin)]. Keep in mind that Lebanon's compulsory military service was abolished in 2005 under Law 665. 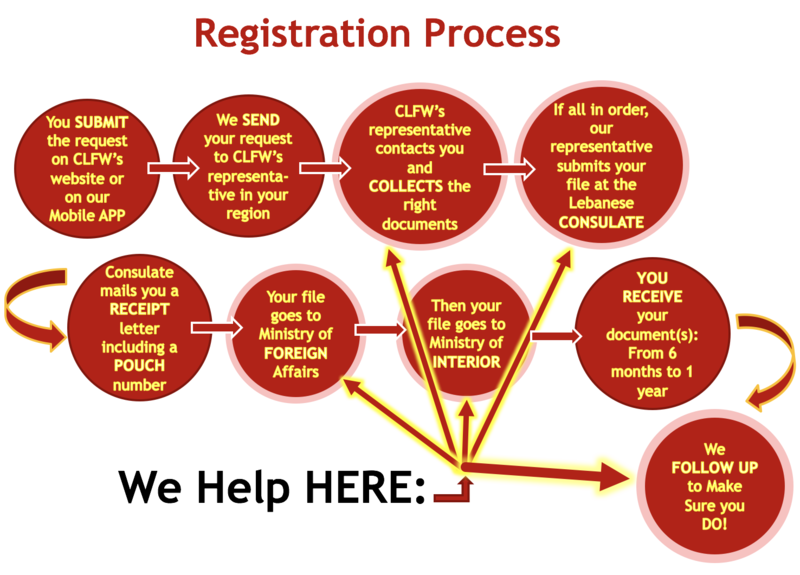 2- Why should I register my marriage/birth in Lebanon with CLFW? 3- Who has the right to register in Lebanon? The right to register in Lebanon comes from the existence of a Lebanese family line devolved through the father. For information about the “Lebanese Citizenship Reacquisition” Law # 41 and your eligibility to register your birth in Lebanon, click HERE. 4- Does registering my marriage and/or birth in Lebanon affect my US citizenship? Registering your marriage and/or birth in Lebanon merely records your life events in Lebanon. It does not affect your US citizenship at all. When you register your marriage or birth, this does not mean you give up any right of the US citizenship. 5- Can I hold dual citizenship in the USA? In the United States of America, it is, in general, not forbidden to hold citizenship in two countries, when there is no intent to relinquish the U.S. citizenship. For further information about this issue, please send an email to info@clfw.org. 6- Which are the main documents needed to register a marriage and a birth? 4. Relevant APPLICATION FOR MARRIAGE REGISTRATION duly filled out and signed. 3. Mother’s Lebanese ID (or Birth Certificate/Passport if she’s not Lebanese). 6. Relevant APPLICATION FOR BIRTH REGISTRATION duly filled out and signed. 7- Where can I find the Relevant Applications for Marriage and Birth? Click on the link that is relevant to the consulate in charge of the city/state in which you were married/born. If you do not know under the jurisdiction of which consulate your state falls, click here. 8- Where can I find an Application Form for a Personal or Family Civil Registry Record (Ikhraj Qayd)? Click HERE for a specific form prepared by the General Consulate of Lebanon in New York. 9- What is the registration process? 10- Can I register my marriage or birth directly in Lebanon if I was married or born in the USA? NO. You have to do so in the US through the consulate in charge of the city/state in which you were married/born. 11- If I believe in your cause; how can I help? 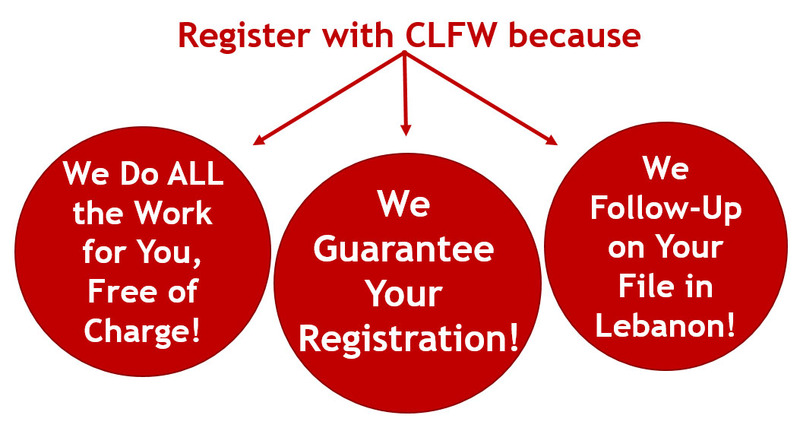 · If you would like to help, send an email to admin@clfw.org or fill out the form on the following page: http://www.clfw.org/join.html. · We hold registration campaigns almost on a monthly basis in churches, clubs, and/or restaurants in different US cities and states. We always need representatives and campaign managers. For our latest campaigns, check "Our Campaigns" section of this website and our Page on Facebook: http://www.facebook.com/clfworld. · There are four million Lebanese in Lebanon, but there are more than 3 million Americans of Lebanese descent in the US!! We urge you to encourage ALL your friends and relatives of Lebanese descent residing in the US to register their marriages/births in Lebanon. They can contact us anytime and we will help them with the process from A to Z, free of charge! Our Cause is Vital; Our Task is Tough; But, Together, We Can Prevail!